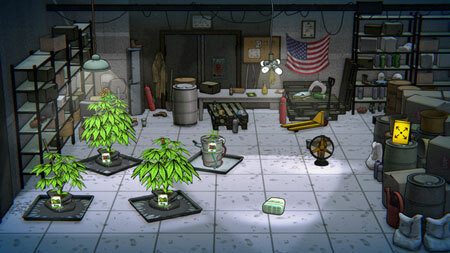 Weedcraft Inc is an awesome strategy management game developed by Vile Monarch. Explore the business of producing, breeding and selling weed in America, delving deep into the financial, political and cultural aspects of the country’s complex relationship with this troublesome and promising plant. Cultivate killer plants, cross-breed them to create unique strains of the devil’s lettuce, hire and manage a growing staff, and be prepared to take on the competition. Decide when and where to take on extra risk to maximize profit, but be careful, the cops and politicians are all working their own angles. Whether you choose to hobnob with politicians, pay off the police, fight for medical marijuana rights or work the legal system, it’s all in the name of the sticky icky and your cutthroat corporate profits. If you get stuck in the game, check out the video walkthrough and gameplay for the game. This entry was posted in PC Games, Walkthrough and tagged Weedcraft Inc Cheats, Weedcraft Inc Gameplay, Weedcraft Inc Guide, Weedcraft Inc Strategy, Weedcraft Inc Walkthrough by Marvin. Bookmark the permalink.